The story of Nickent Golf is the story of a young upstart company attempting to make inroads against the Goliath that is Callaway, Ping, et. al. Sadly, the story does not have a happy ending. Founding Nickent in 1996 with the intent of bringing innovative technology and high-quality clubs to a mass audience, co-founder and CEO Michael Lee found an avid audience for his initial releases. The company managed to sell north of a million clubs in their products’ first twelve months on the market. Fast forward nine years and Michael had established a small foothold in the market by producing “hot” clubs and by consistently innovating. Their 3DX series — created by legendary designer John B. Hoeflich — was well received by critics upon its introduction in 2005. Its tungsten-plug weighting system coupled with extreme perimeter weighting made these clubs a hit with migh and mid handicappers. 2007 may have proven to be Nickent’s banner year. US Open winner Angel Cabrera carried a Nickent hybrid during his win, generating enormous publicity for the company and helping them back up their claim to be “King of the Hybrids”. Sales rocketed to $15m, still a drop in the bucket for industry titans, but nothing to sneeze at for this up and comer. Nickent’s release of the 4DX line, including their flagship Evolver Driver, spelled the beginning of the end for this plucky startup. With their aggressive gamble on the commercial success of interchangeable shaft drivers, Nickent left themselves vulnerable when the economy tanked in 2008. 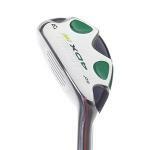 Nickent did manage to release a 5DX line in 2009, aimed at lower handicappers. Unfortunately, they also went into receivership in the middle of that year. Once again, the clubs were well-received by critics but proved to be too little, too late for the firm. 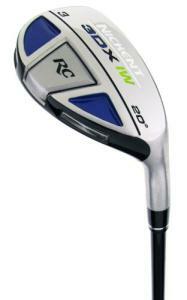 The end result of all this drama means that Nickent clubs can often be found at a discount price. If you don’t mind owning clubs from a company that is possibly defunct, you just might score a bargain on some pretty sweet clubs. Putters, putters, and more putters... holy cow, there are a lot of putters out there! This one is the Nickent Pipe Putter with a Flare Tip Blade.